Product features: The slurry tanks manufactured by Aojie Solids Control Co., Ltd. should have a wide range of advantages, such as high corrosion resistance, rust prevention, and long service life. Slurry tanks Aojie solids control professional mud tank manufacturers, our company's mud tanks are mainly used in oil drilling, directional crossing, gas exploration, sewage treatment and other industries, with a high degree of anti-corrosion, anti-rust, long life and other advantages. The slurry tank circulation system is divided into a square tank and a conical tank according to the bottom shape of the tank. The tank body adopts a flat-plate conical structure or a corrugated structure, and the steel plate is welded with the steel section. Cans and corridors are made of non-slip steel plates and non-slip bar nets produced by professional manufacturers. Tank railings are made of square steel pipes, which are barrier-free foldable structures and are firmly connected. Mud Circulation System The tank surface is equipped with clean water lines to clean the tank surface and equipment, and the tank stencil is treated with zinc immersion. The upper tank ladder adopts the channel steel as the main body, and the non-slip bar-shaped net plate is used as the pedal, and the double side guardrail is provided with an insurance hook. 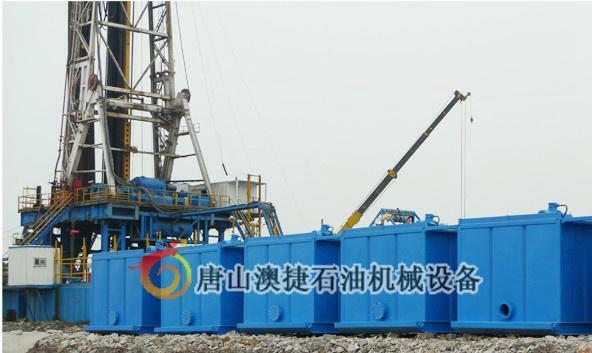 The oil drilling mud tanks are equipped with standard sand control and rainproof sheds, and heating and heat insulation pipes are installed inside the tanks.